E for Evan was a really big week here in the Tseng household and it was going to be tough for Letter F to kinda top it so took it easy and I gave it some space between both letters opting to do Letter F late in the week instead. And truthfully, I had to deal with a spanking new addition to the family too! 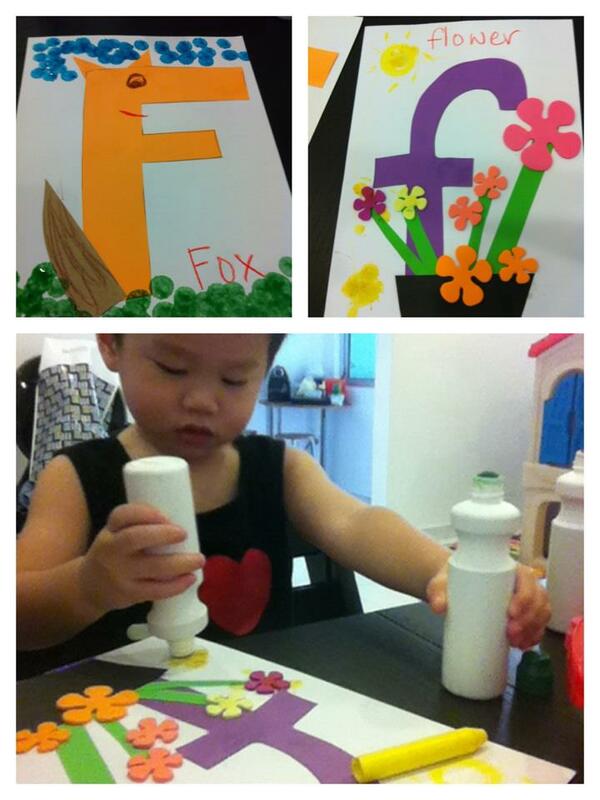 I opted to fo F for fox and flowers for the crafts but also to share that F was for fish, fan and flamingo. It was easy enough to entertain Q with these: we pretended to swim like fish about the house, spin like the ceiling fan (this the kid REALLY liked doing) and standing on one foot like a flamingo in my pink scarf. We made a little fox and a big flower garden for the craft work- the flower one was a real hit cos there were tons of foam flower stickers to play with. And later that night we read one of our favorite books from the “Tales from Acorn Wood” series- Fox’s Socks by Julia Donaldson (of “The Gruffalo” fame) and Axel Scheffler (who also illustrated Stick Man). This entry was posted in alphabets, Book, education, Learning Crafts, Letter of the week and tagged alphabet, axel scheffler, book, education, julia donaldson, learning, reading by matchingsocks. Bookmark the permalink.